If you’ve been reading the captions of the photographs in this weddings gallery you’ll see a common theme : I love the Bowery Hotel. I’ve shot many gorgeous weddings here and worked with some of my favorite clients at this iconic Manhattan wedding venue. The ambience of this space really lends itself to unique, vibrant weddings and this 2012 event was no different. I love that the bride and groom included their beloved bulldog in the ceremony and I love even more that he’s wearing a burgundy waistcoat! This image was taken during the wedding ceremony while the dog sat in front of the line of groomsmen. I love how each man is doing something different with his hands while they’re all dressed similarly. I love the repeating patterns of the brickwork on the ground and the way the lines lead right back to the lines of their legs. 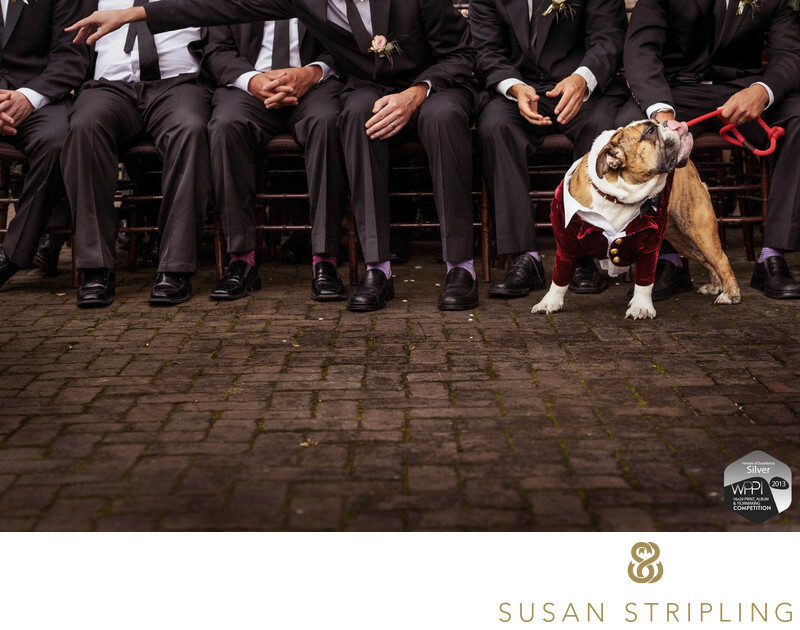 Most of all I love the bulldog and how he’s looking one way while the one groomsman is pointing the other. And best of all? The tongue sticking out of the dog’s mouth. This was one of my favorite images of 2012 and I entered it into the WPPI 16x20 International Print Competition - something I only do with a very select few images per year!Keywords: New York City (207), The Bowery Hotel (30). 1/640; f/4.0; ISO 1100; 70.0 mm.